What is the point of a vacation if it doesn’t, upon your return, make you appreciate how relaxing your regular routine can be? Brief recap. 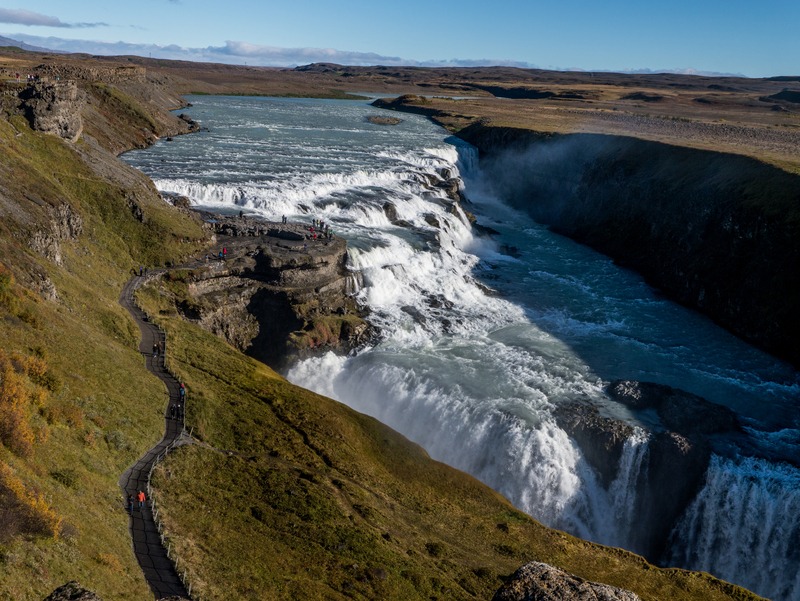 As I start this post, I’m heading into week two of my Iceland trip. It’s cold, it’s windy, it’s rainy, and I haven’t seen the aurora yet. But I’m having a great time. 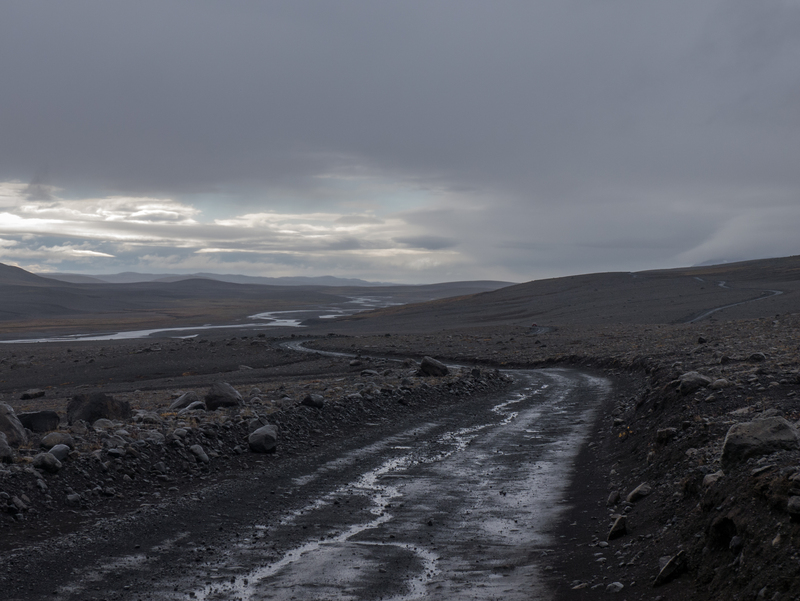 After reaching Husafell, I’m headed up into the Storisandur to the north of the Langjokull glacier. The Storisandur, on a good day. 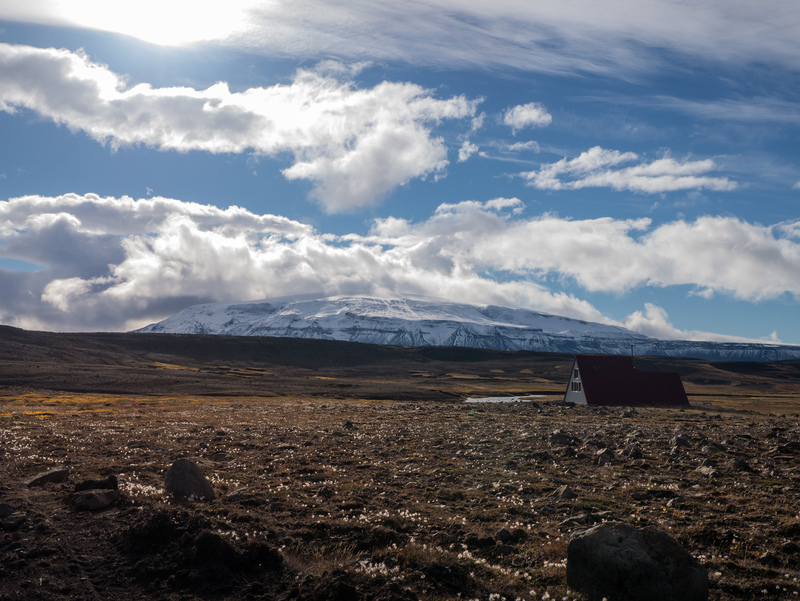 The Icelandic highland is one massive volcano. 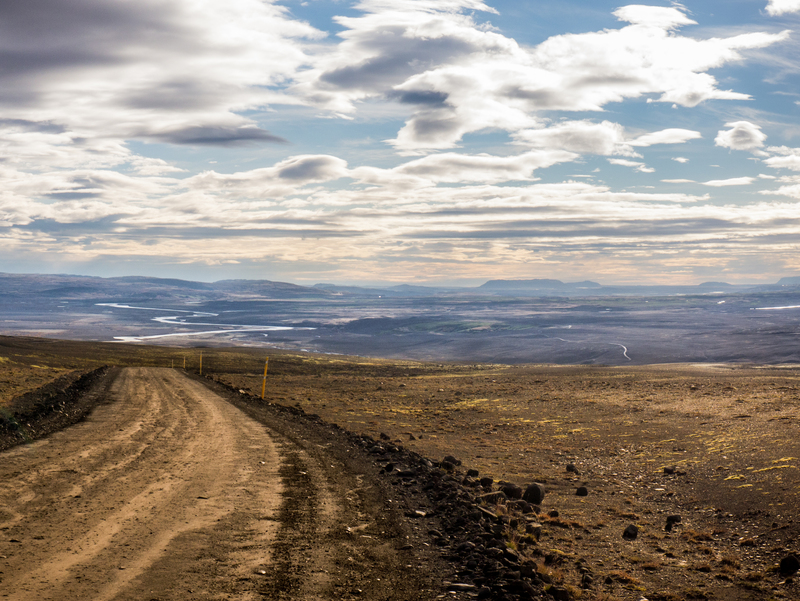 Roads wind their way between ancient lava flows, caves, and over fields of sharp rocks. You can pretty much identify where tours have stopped to camp based on little fields of what look like former rock stacking competitions. 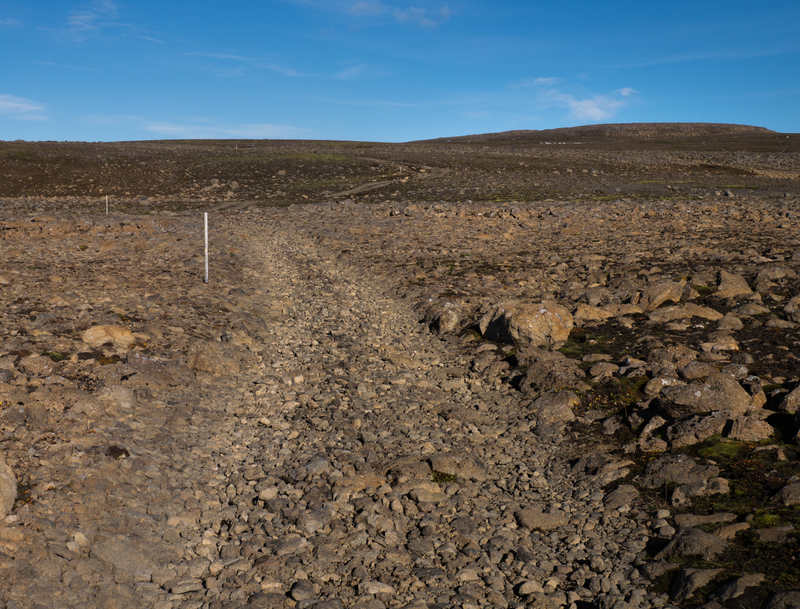 Every few hours up over the Storisandur I’d come across a small area with more than 20 little carefully-balanced rock towers. I didn’t take any pictures of these. More from a good day on the Storisandur. 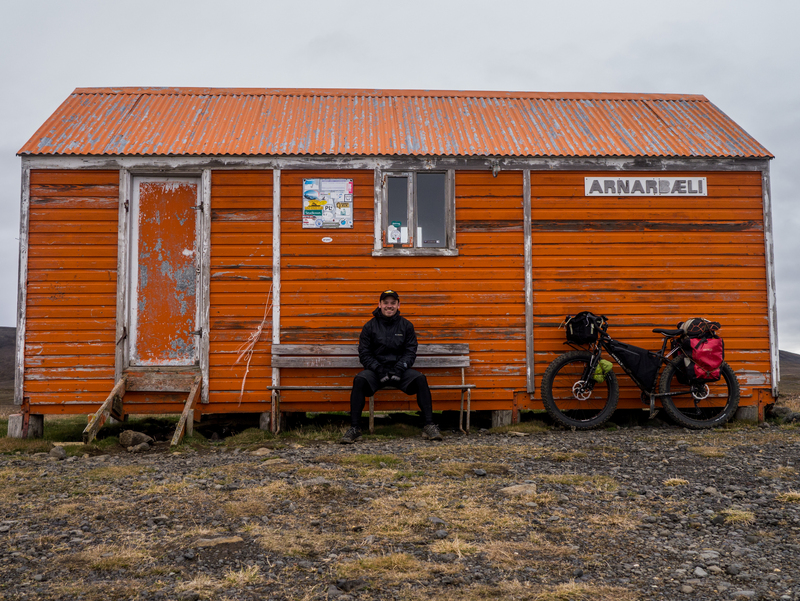 A few mountain/emergency huts dot the landscape up here. Closed, and vacant, of course. 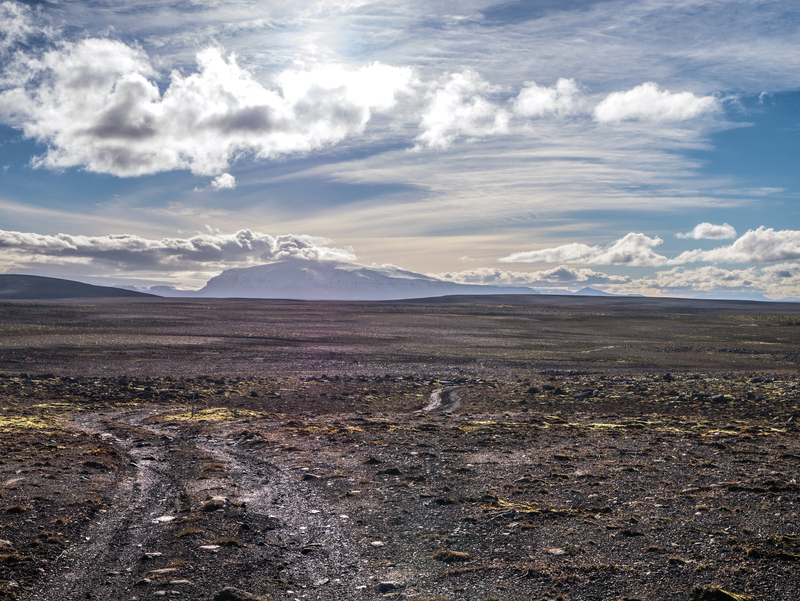 I was fortunate to have mostly nice days going up over the Storisandur, as this part of the trip would have been absolute hell otherwise. The road I was on rapidly disintegrated into some really nasty riding/walking. It would alternate between a 4×4 track and just a collection of markers wedged into the rocks that I was supposed to just follow. Certainly some of the toughest going that I’ve had on my trips. Throw in the occasional frigid river to ford, and it was sort of slow going for a few days. I didn’t see any people up there in this season. 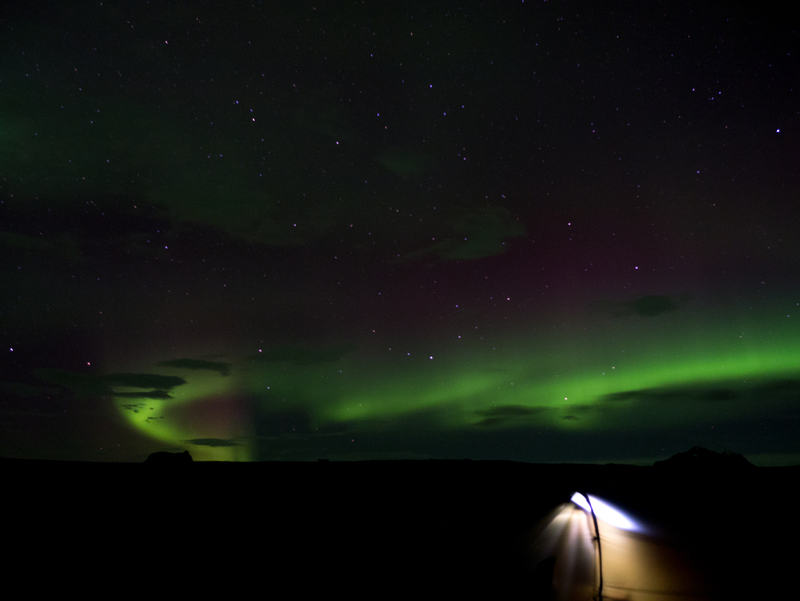 As I mentioned, a few old campsites from the high season, but other than that I was alone. I don’t even know what kind of cars would have gone up that way. Certainly something tough. 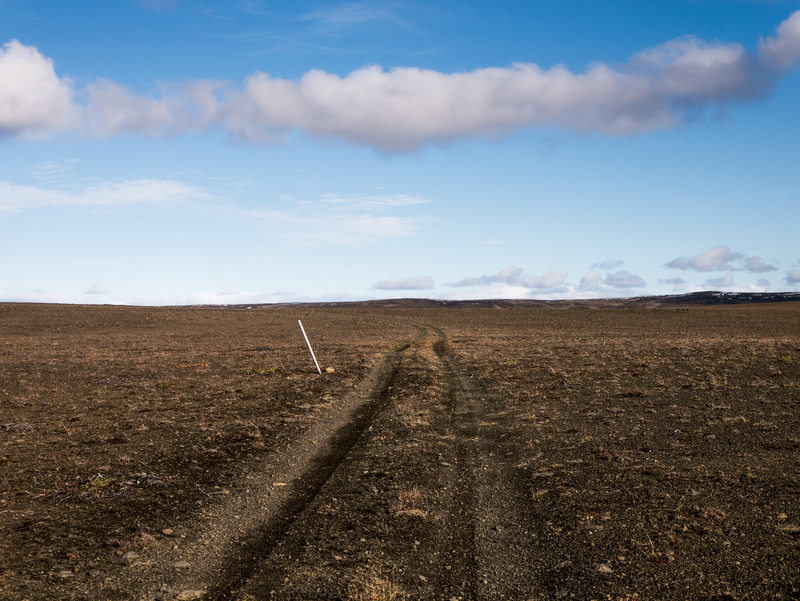 There was a lonely airstrip up there, so it’s possible that it was just genuinely impossible to get cars in and those people who had visited had just flown in. I bet it was a bumpy flight. At a lower elevation. Sandy, but still pretty easy going. it might be easier to see the road here, but this is unquestionably tougher going. Large rocks. Now this, this is just absurdly tough going. 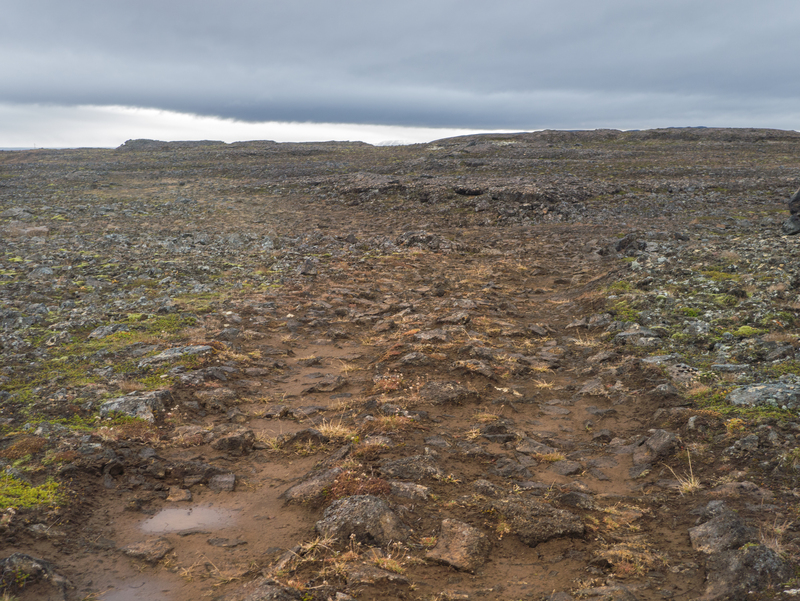 Sharp, large rocks, and the road is hard to see. Tons of dead end paths. Although you can’t see them in this picture, this is the point where you just have to keep following the sticks. 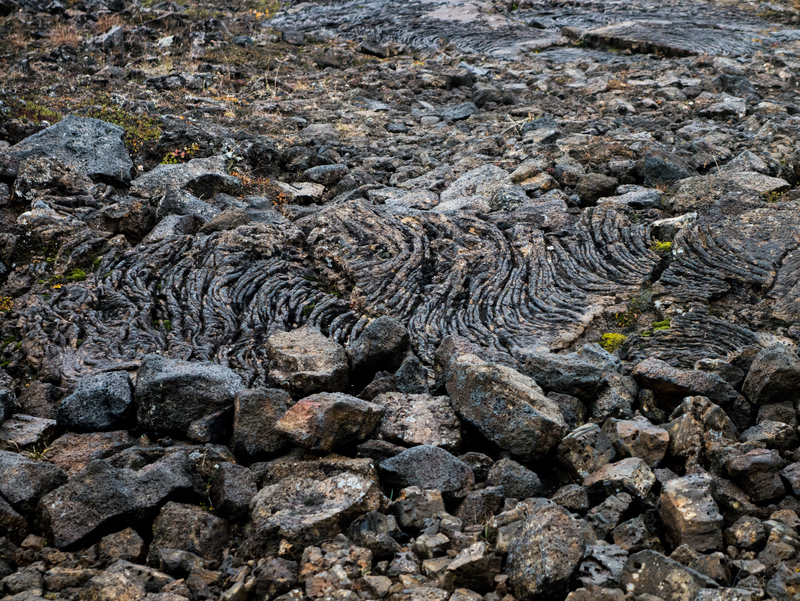 Old lava flows abound. Sometimes they were next to the road, sometimes they WERE the road. I thought the rocky landscape would prove more of an issue for my freestanding tent, but I was usually able to find enough places with soft dirt in which to stick the stakes. 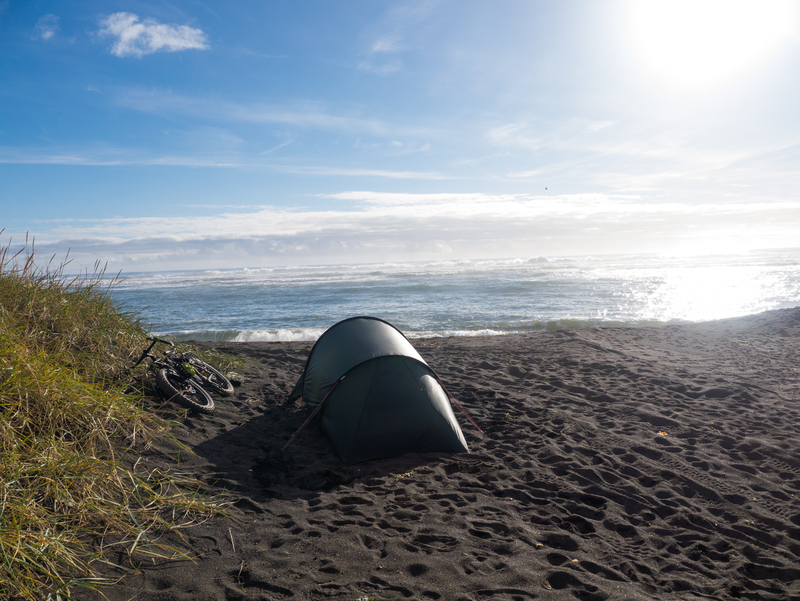 However, the wind at most of my campsites was responsible for one of the larger annoyances of the trip. 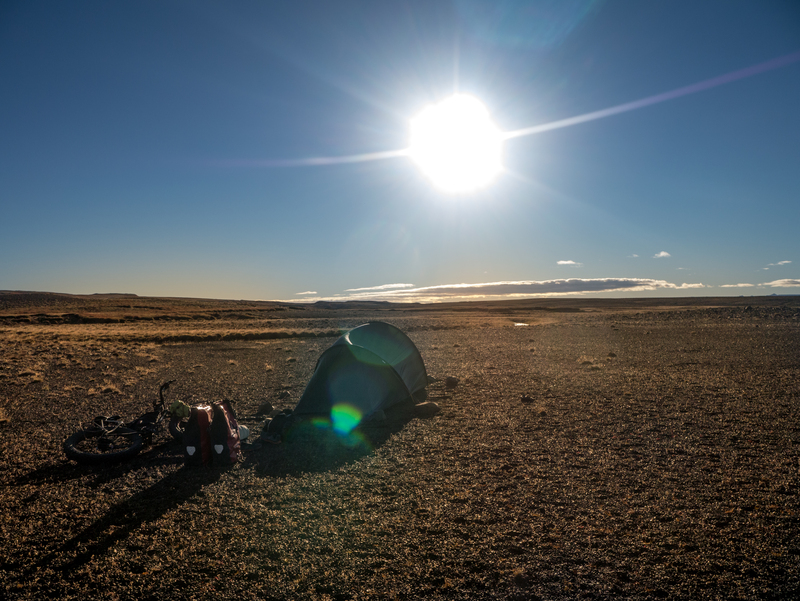 Every morning I’d have to spend a few minutes straightening out my tent poles, as they had usually been deformed by the wind during the night. Even the nicest days and evenings had wind that would shake my tent loudly all night. I would be remiss if I didn’t again mention the lighting and color of the highlands. Some afternoons, with a mix of rain clouds and low sun, would bathe the whole region in this awesome glow. With nothing obscuring my view, I could see for miles, often to the edge of whatever rough weather I was, at that point, experiencing. At these times, it was wild. The colors here, for example, were intense. The same mountain with a different lens. Just absolutely weird. Almost apocalyptic. I was fortunate with the weather on this stretch. 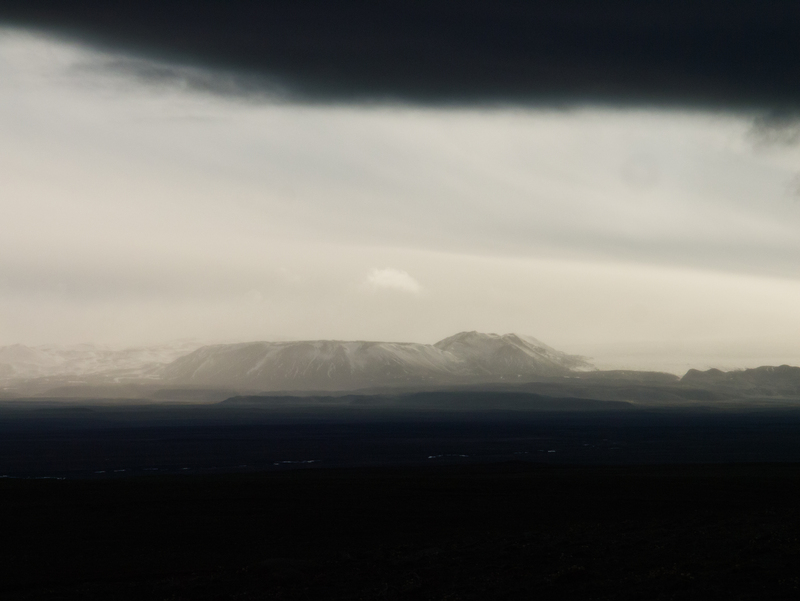 As I was descending, however, it started to sleet and hail, and my good fortune became much more clear. 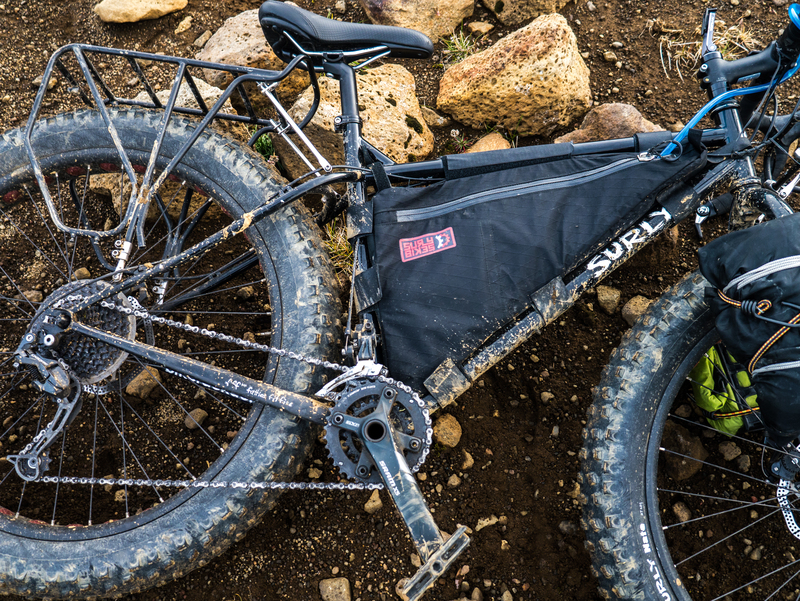 I had seen some patches of snow at the higher elevations, but I didn’t really get hit until after I was through the rough stuff. Looking back at the pass the morning after and seeing it covered with snow, I wondered if I was literally the last person to go over the top this year. I counted my blessings, and headed on. 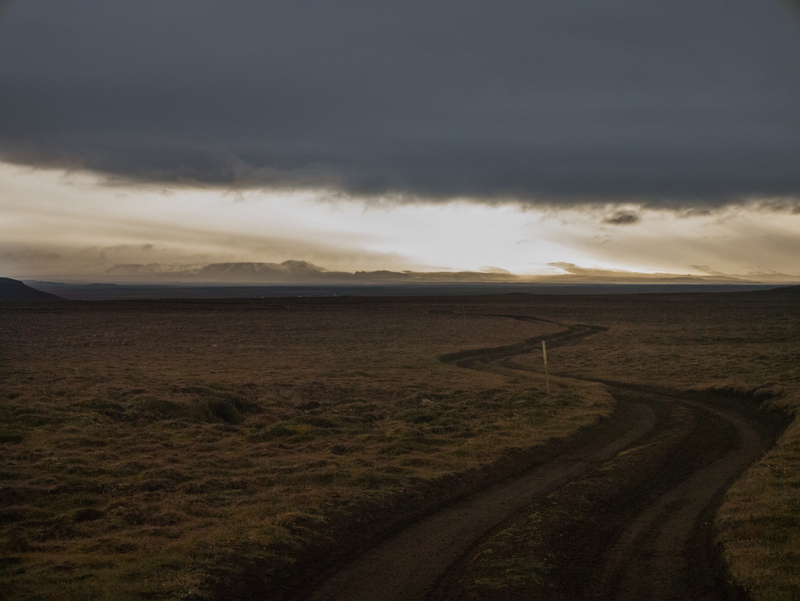 A sign at the end of the road and the intersection with the “larger” Kaldidalur route somewhat confirmed my suspicions. …and I’d just come over the top the day before. After that experience, I joined the Kaldidalur route, the “main” thoroughfare through the highlands. That means I went from 0 cars in three days to maybe 1 every two hours. An infinite increase in traffic! 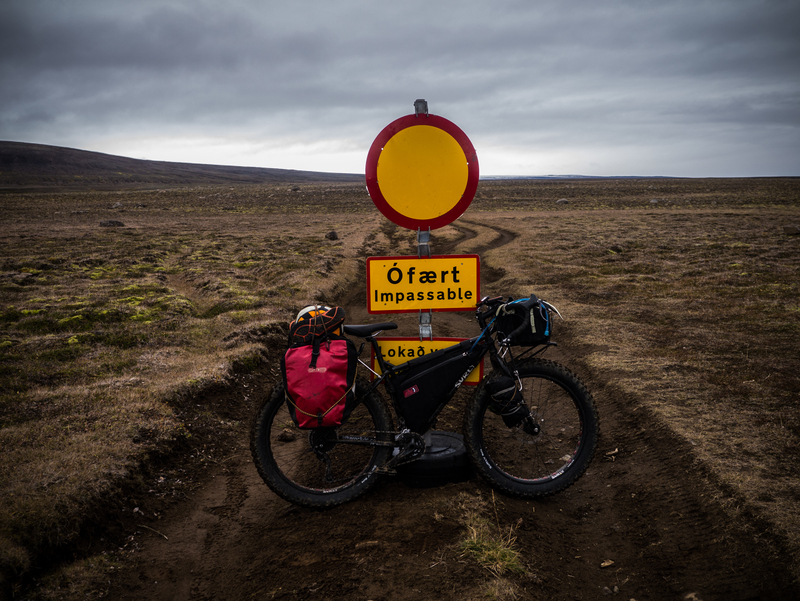 Here I finally turned south and for my efforts received my very first true tailwind of the trip, although the bad weather was back and this time it was hailing and sleeting. I don’t know which, me or the emergency hut, is more beat up in this picture. 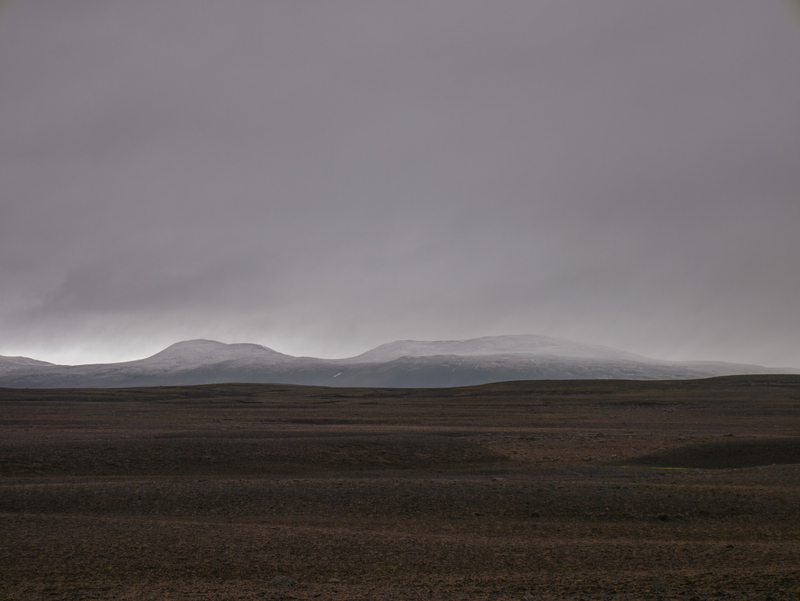 A very cold night at Hvervellir and a much colder ride the next day had me finally heading out of the highlands and leaving the bad weather behind. My last four days of the trip were clear and sunny, with daytime highs that I considered ‘almost warm’. (I didn’t have a thermometer) That unfortunately meant that the night was very cold, and I’d usually wake up with frost on my bike. However those clear nights and days were what I had craved ever since I started planning this trip. Why? Well. Can’t do this view justice. Still very windy, but the sun was nice. My first clear night, I woke up to go to the bathroom and without looking at my phone started to wonder if it was getting towards dawn. Nope. Midnight. 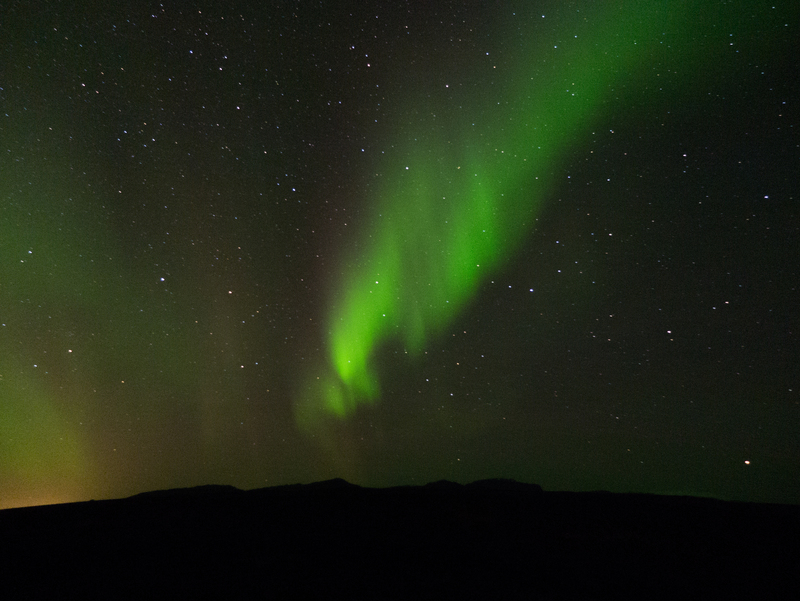 I had, however, camped out in the middle of nowhere, fallen upon the first night of a strong aurora event, and ribbons of green light stretched across the entire night sky. Night 2. Yes, it does. And yes, it can. Full-blown, (a little lighter than these pictures) green and purple lights in the sky, dancing and rippling. Everything I wanted from it and so much more. I have so many more pictures. 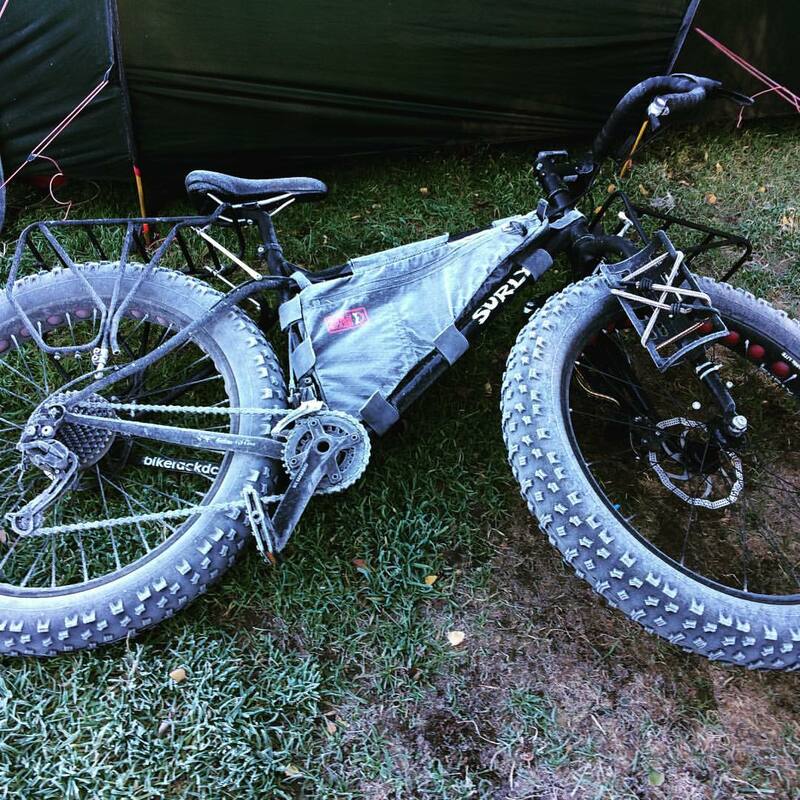 Every night I’d set up my tent, munching on snacks and waiting patiently for it to arrive. Then it would, for a few hours every night, mostly with just one single streak across the sky. 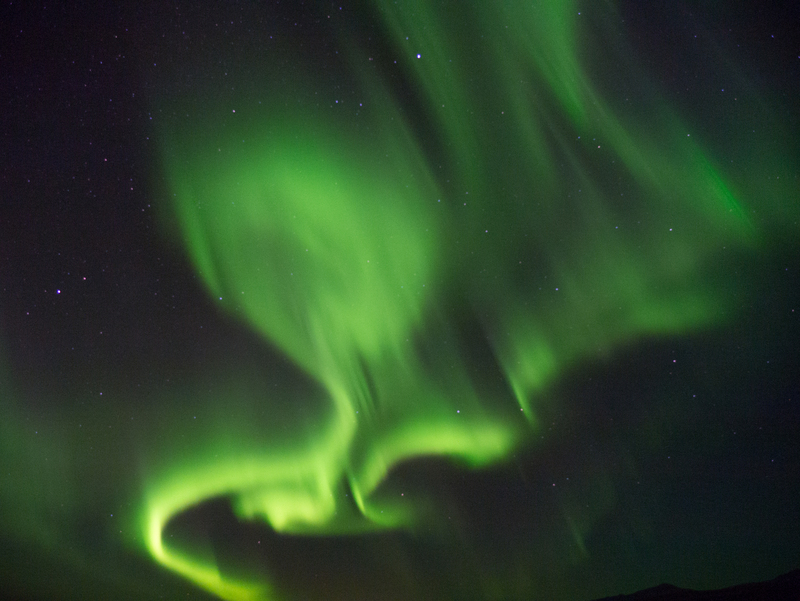 But then for about a 20-25 minutes in the middle, it would peak in just these absolutely intense bursts of light. So cool. It actually got frustrating after awhile because with the dark I was also trying to take some long exposure pictures of the stars. 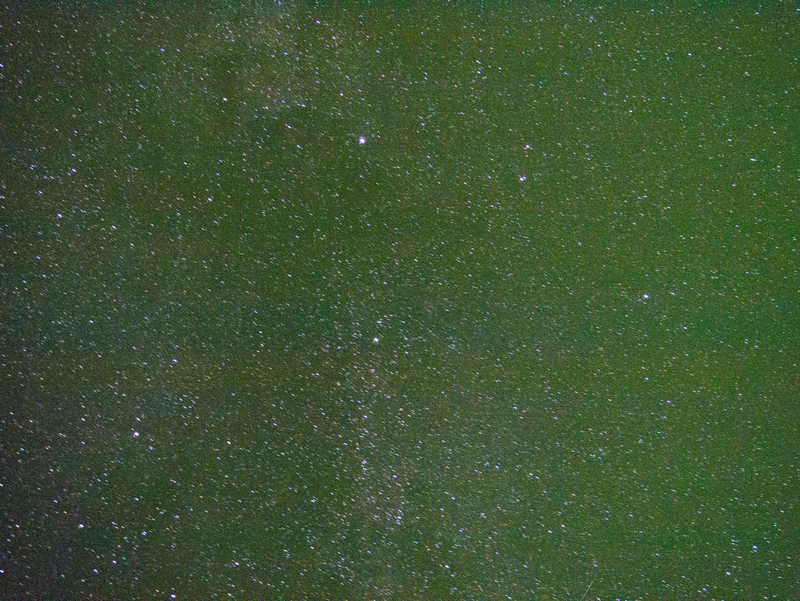 I never got a really clear shot because the aurora (invisible at that point to my naked eye) would sneak in and suddenly all my 30 second exposure star pictures would have a not-so-subtle green glow to them. Alright. Back to riding. Out of the highlands for a day I rode around the area near the tourist attractions of Geysir and Gulfoss. These areas are always a bit of a shock to the system, for one reason or another. People everywhere, asking me questions about my trip, about the bike, etc. That dreaded question: “How far do you go in a day?” Alright. Nice waterfalls. Moving on. 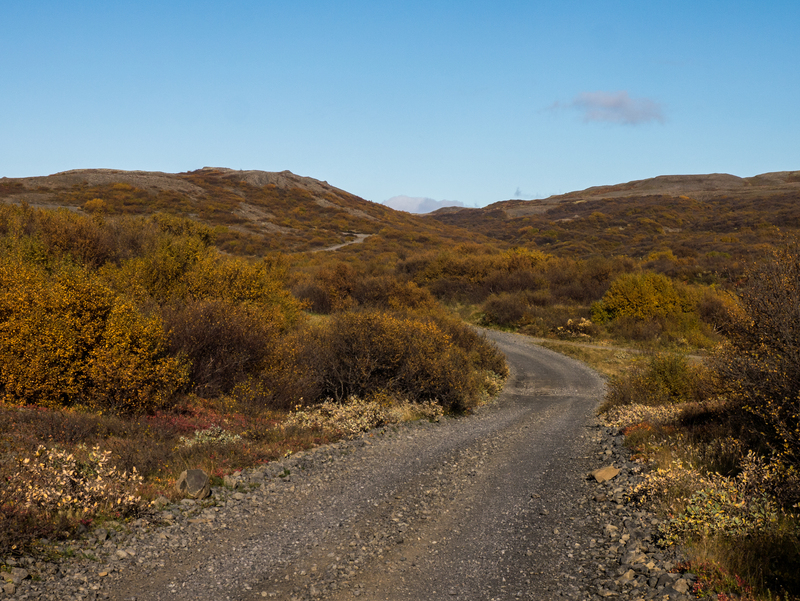 In between aurora nights, I wasn’t going to be caught dead at a developed campsite, so I trekked up on another lonely road during a very sunny day. Down here at the lower elevations, trees and bushes were in full fall color, and it was gorgeous. 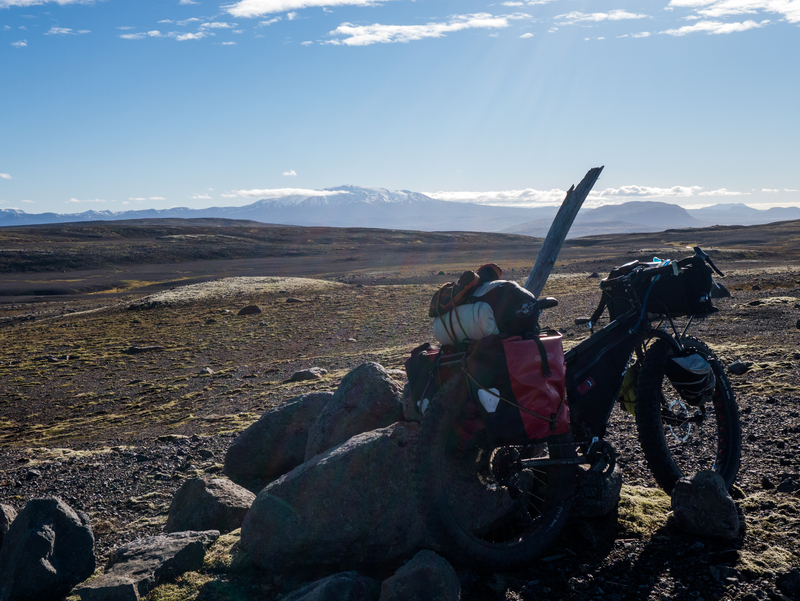 Up and over one final pass overlooking the Hekla volcano (which is particularly… active right now) and then a quick couple of days down the road to the coast, and a downright pleasant sun-drenched campsite on a black sand beach on the south coast. 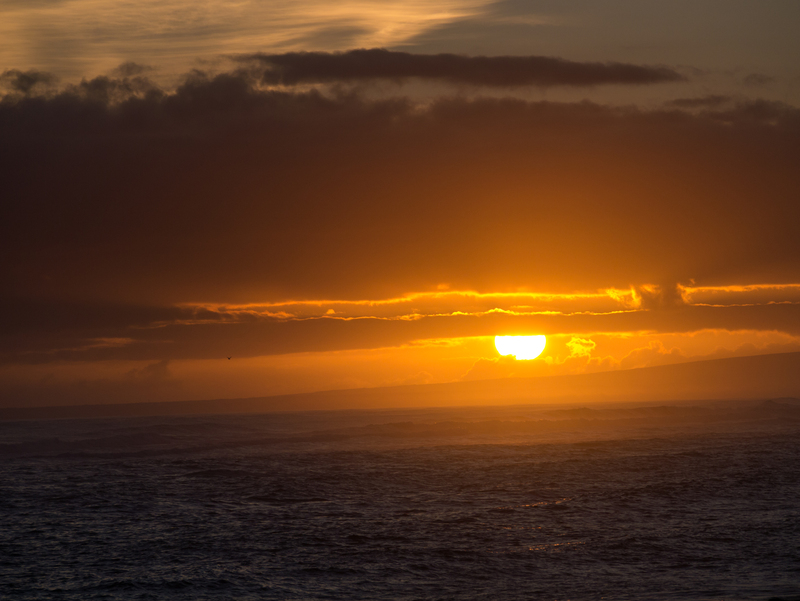 One final night of a gorgeous sunset and another intense aurora before a two-day sprint to the Keflavik airport to catch my flight. Sunset shots are so played out, but this one was particularly nice. 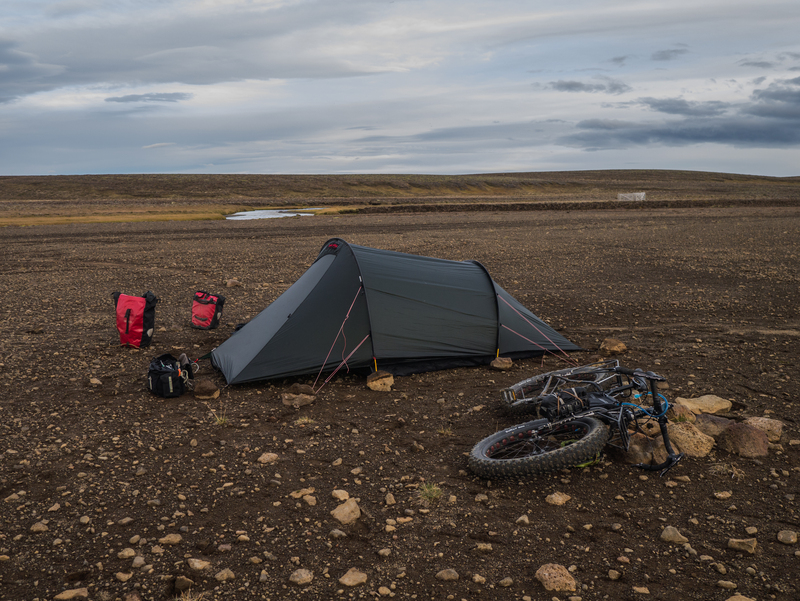 A bike trip to Iceland in September? … Do you like pain?